Have a computer? Want to help? Have you ever aspired to effecting change? It is true that most of us are not able to change very much – it just does not lie within our power. But when we start to add people together to become a group, and exert influence to increase the size of the group, we will eventually reach a point where the group becomes influential in a larger sphere. 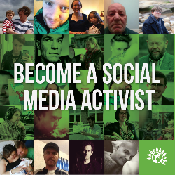 This is exactly what we are trying to do as Social Media Activists, and the ones I am working with are working for the Green Party. And we want to change the UK for the better! An astounding 2000+ supporters have already joined this group! If we could triple this figure we could reach millions of voters with our message before the General Election. Its partly the people, and partly the program they are presenting. Another factor is that the old parties have proven beyond the shadow of a doubt that they do not govern in the interest of the people at all, and this means that democracy is not working! We can do better than that, with the right people in charge. Let’s put them there! Its time to go Green! The structure may be a little unusual, in that there are two Deputy Leaders of the Green Party, but when you realise that two heads are better than one, especially when each is covering different aspects of the situation, it all makes perfect sense. You don’t have to take my word for it! “I want to talk about Climate Change and Leadership – Green Leadership. 0.8 degrees rise in Earth’s temperature since the pre-industrial era. 9 out of 10 of the hottest years on record since 2000. 2 degrees the point at which catastrophic change is more likely than not. Carry on business as usual and we can reach that point by mid-century! Perhaps these facts are too alarming. Perhaps we’d rather not think about or do anything with them. To the contrary, what’s alarming is the indecision, inaction and bogus priorities betrayed by our leaders. Climate change denial would have Vote Blue-Go Green-Cameron fly over to the Arctic in 2007 for photo op with huskies. I wonder whether that patch of ice still exists? Climate change denial would have them plough another £30bn into road building schemes and promote airport expansion instead of affordable public transport and investment in walking and cycling. Climate change denial would have the government invite tenders for fracking as a viable source of energy generation – fossil fuel intensive, and contaminating the water table. Climate change denial would have our leaders promote pre-Christmas sales hype in order to boost the economy. What am I bid for flat-screen TV on Asda Black Friday? Carbon production exported to China then imported back here to massage our EU carbon allowances! Riots expected! Cha-ching! Climate change is a justice issue. 600,000 deaths occur worldwide every year because of it. 95% of these deaths take place in developing countries. The double injustice of Bangladeshis in low-lying coastal areas being made to suffer the negative consequences of sea-level rises due to the West’s overconsumption – that they are both least responsible for and least able to afford the remedial action to contend with. Climate change denial is to give ourselves targets and set some new ones when the earlier ones have already been missed. What am I bid? 20% by 2020? 80% by 2050? Using 1980 levels or 1990 levels? Greens are the only game in town to counteract climate change denial. We’ve been talking about it from the get-go-Green, with joined-up policies on energy generation and efficiency, transport and waste, and doing about it as elected Greens. Our councillors in Kirklees initiated a free home insulation programme for 30,000 homes, reducing energy waste and saving households on average £150 per annum. The UK is the third lowest producer of renewable energy in the EU. Just look how much unharnessed wind, wave and solar we have at our disposal! Do the real security needs of the UK lie in £100bn Trident renewal? No. Greens say new renewable energy industries could be set up in the same area and use the same skills and resources as the existing arms industries: such as conversion of shipbuilding plant to wave power or aerospace to wind power. Greens understand that the bottom line isn’t the bottom line. We need to fix the broken economy not round the edges, but wholesale. Currency is a convention that currently exacerbates inequality in society. Labour and ConDems printed money out of a politicised Bank of England – only to ease the bankers and brokers’ liability for their own casino-style fleecing of our savings. We need a carbon-based currency that promotes stewardship of the Earth in our every transaction, backed up by our responsibility to the other species we share this beautiful planet with and the future generations that aren’t around yet to press their entitlements upon us. We have presided over the fetishisation of Keynesian economics and pursuit of endless growth like there’s no tomorrow. Yet there is a contradiction at the heart of this goal, even in the reflective minds of those most succumbing to it. The more you earn the more you think you can’t afford what you really need. That can’t be because you don’t have more stuff. It is because you’ve generated increasingly insatiable desires to substitute for the ones that have already been satisfied. For in-built redundancy read in-built neurotic trap. The American dream becomes a nightmare. What is to be our legacy as a human race? The despoliation of the invaluable, irreplaceable species we share this planet with, including our own? For the sake of austerity debt-finance? There is nothing more painful than an uninhabitable planet. Green leadership goes well beyond electoral politics and is required now more than ever. It is not practiced only by the named leaders. To the contrary it is lived by us all. We reject the hierarchical structure of leaders and cheerleaders. It is said good leaders create good leaders. This is nearly right – the truth is there is leadership in all of us and we need to create the conditions to help bring that about. Green politics is a full time job. But not quite a job; it’s a way of life. With apologies to the Working Time Directive, we don’t know how to take time off. We are driven by the need to restore health to this planet. Ours is a collective calling. Therein lies our duty and what kind of leader does it make us? You need only to be Green. Empowerment and Ownership. Not control and power over. I doubt Alice would want the leader who boasts, in 2003, “Even if I’m the only person left saying it, I’m going to say it. I may be wrong in believing it but I do believe it.” Yes, Tony, you were the only person left saying it. There were no WMD, or even weapons-of-mass-destruction-programme-related-activities: add-your-favourite-evidence-base-extension. Blood on your hands. No apology. War crimes tribunal over your head! Or do you want the leader who claims to want to rise above personal attacks, yet dispenses these on a daily basis upon migrants? Yes, Farage, you are quite right that you would not make a good Prime Minister. If ice-melt causes the Gulf stream to divert and the UK gets plunged into sub-Arctic temperature, we will all be the new migrants. Or do you want the MPs who won’t get out of bed for less than £69k? Cash for access: Cha-ching! What’s all this about us having to pay more for decent MPs. The opposite is the case. I rather suppose that were you to offer the average national wage, you would get substantially improved intake to Parliament. Let us however attempt job share MPs, to help bring a greater diversity of people into Parliament – on the Eve of International Women’s Day. Green leaders all around. Thank you Chis Southall in Clacton! Thank you Abi Jackson in Middleton! Thank you Clive Gregory in Rochester! You did the Party proud in unforgiving by-election territory. Good luck Darren Hall in Bristol West! Good luck Lesley Grahame in Norwich South! Good luck Caroline in Brighton! Let’s make it happen! I was asked by a friend which time and place would I choose to be born into. Let that time be right here, right now! These people really are making sense! The Greens are Making Sense! I have been watching the progress towards the election in the UK with some interest, and am very pleased to see that the Green party is sending an eminently sensible message which is attracting a big surge in party membership. I find this very gratifying, for there needs to be a valid alternative to the proven failures of the Conservative and Labour parties (New, or otherwise). And now a name that I am not familiar with comes to the fore:- Amelia Womack, who is the Green Party’s Deputy Leader. After reading the speech she made at the party conference, I am perfectly confident that she is a great addition to the party leadership, which is at the moment predominantly female. “It is a great privilege to be here, as your deputy leader, at the biggest conference this party has ever seen. And it’s great to be here in Liverpool – Although my initial inspiration about the importance of our environment and communities came from Wales where I was born and grew up, it was right here in Liverpool – where I studied at University – that my passion for environmental and social justice was truly formed. Just over seven years ago, a bank called Lehman Brothers collapsed on the other side of the Atlantic. Its collapse was due to an unaccountable and broken system in which greed flourished and bankers were answerable to no-one. Yet, far from triggering a radical overhaul of our economic order, the financial crash was used as a springboard to further the interests of the wealthiest and most powerful members of our society. Sky high levels of inequality have continued to plague our communities. Government cuts have hit the most vulnerable, while the richest have become richer. We now live in a country as defined by our foodbanks as we are by our football – as known for our tax avoidance as we are for our tea. We live in a country where the majority of people have been forced to pay for a crisis that they did not cause. And we live in a country where those at the top, and the multinational companies – still don’t pay their fair share of tax – while those at the bottom experience cuts, sanctions and attacks on public services. Let’s be clear. Times have been tough – and this government has only made things tougher. The so-called good news from this week: that ‘Britain is back on track’ – simply does not stand up to scrutiny. Average incomes lower than in 2010. Wages for young people down 7.6% since 2007. That isn’t a recovery. That is a resounding failure. But, we are here today – and in record numbers – because we know that there is hope. I have hope today, not just because this party offers the bold solutions we desperately need – but also because of all of you who have come to this venue and who will play such a vital part in shaping our policy, debating our direction and building our campaign in the weeks to come. Because without you, the fifty five thousand members of this growing movement, we wouldn’t be where we are today – higher than ever in the polls pushing to win more seats at the general election and ready to change British politics – and to change it for good. To those of you who joined recently – and there are many of you here today – Welcome. Welcome to the fastest growing political movement in England and Wales, welcome to a party that puts you – the members – at the centre of our decision making. Welcome to the only party fighting in these elections that can truly be called democratic, open, and accountable. There is much work to be done. At this election we have more doors to knock on than ever before, in more constituencies than ever before. We have the chance of a generation to show that things can be done differently – but we can only do that with the help of each and every one of you. We won’t win record results at this election through hard work alone. We will win more votes than ever because we are the only party standing for bold steps to cure the sickness in our economy, and in our politics. – That the market should serve people, not rule over them. – That public services – Our NHS, Our Universities, Our Schools – should be run for the common good – and that we should pay for them together. – That the planet is not ours to exploit; we have a duty to protect and conserve it for future generations. And I have hope today because this Party, and this party only, continues to offer the opposition that others have failed to muster. This moment in our history, when our country runs the risk of being turned over to private interests and sold to the highest bidder – is no moment for half measures. That’s why we will always be bold in our policies – and be honest about who is going to foot the bill. That’s why today I can confirm that our manifesto will include a commitment to free Undergraduate University education, paid for through general, progressive taxation. Because when we say that education is a public good – we mean it. And that’s why our manifesto will be honest about the fact that that we want the richest in society to contribute more. We’re not afraid of speaking about taxation. We are committed to a higher rate of income tax, we are committed to raising more money from corporations and we are committed to using the money raised to narrow the Victorian levels of inequality in this country. And it’s because we are bold that we will go into this election with a clear commitment to end the multi-billion pound waste of taxpayers’ money that is Trident. We want nuclear weapons off our shores and consigned to the dustbin of history. These next two months are not going to be easy. But if we are to send one message out from this conference, a message to be printed on every flyer, a message to be heard at every door upon which we knock – let it be this; that business-as-usual politics is coming to an end. Let it be that we will vote for our values, for what we believe in. Let it be that at this election we will not stand by whilst our supporters are told to vote for simply the ‘least bad option’. The politics of the future does not, and it will not, look like the politics of the past. Whilst I am filled with hope as I stand here today, I am also fearful. We have emerged from the last crisis a weaker, poorer nation – with our public goods hanging by a thread. But the fact is that the next crisis could be just around the corner. Despite many tales of lessons being learnt we still have an economy that relies far too heavily on the speculators of The City of London. We have record levels of household debt. And we have the looming threat of a climate crisis. It is not just the mistakes of the past which need fixing – we need to secure our future too. We have much to prove. Each of us, whether we’re in conversation with our friends or on the BBC News, we all have a role in showing that this party is the party of hope. That this party is one which stands for fairness and equality, not just now but for generations to come. That this party, will never blame a crisis of capitalism on the most vulnerable members of our communities. We go into this election bigger and bolder than ever before, and with the greatest opportunity in a generation to shake up our political landscape for the better. I don’t know about you, but I really feel like we are on the cusp of something, the cusp of change, the cusp of opportunity, the point at which business-as-usual politics has the potential to be shaken up like never before. Together, as a growing party, working on the doorsteps across this nation, we can make history. I am impressed, very impressed!